Life is busy, but I wanted to report on one happy day, a few Sundays ago. 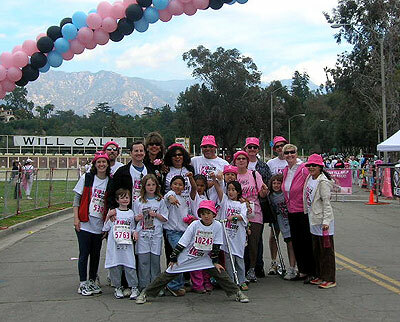 The first year I ran in the LA County Komen Race for the Cure for breast cancer, I did so because I like running, and I thought a 5K for a good cause would be pleasant: a nice run around the Rose Bowl. The next year it meant more: I was running in memory of my Aunt Beth, who had died very rapidly that year from the disease. 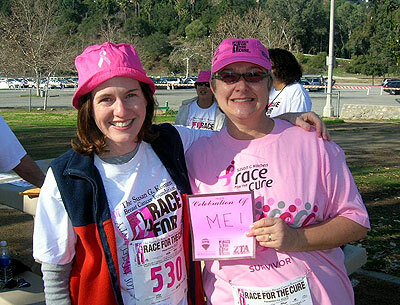 A year later, my friend Susan and another aunt were diagnosed with breast cancer at the same time, right before the annual race. Because Susan is a friend whose life as a mother is much like mine, I felt very aware of her daily struggles. Not only did she have to juggle the parental duties that are difficult enough in perfect health, but she also had to deal with chemotherapy, losing her hair, being too weak to work or drive her children anywhere, being in great pain, looking death in the eye. Suddenly I saw this 5K differently, as a huge support network for women facing this difficult disease. I knew she had to see it: 10,000 people who came in support of her struggles. This year I sent her an e-mail about the race, and she decided not only to do it, but to sign on as a team. So we all ran as "Team Boo"! Before the race, Susan and two friends from her support group attended a "Survivors Ceremony," in which many people were able to say they had survived 10 years, and a number had survived 25 years past their initial diagnosis! Inspiring, indeed. All of us on Team Boo, including the guys, wore pink hats -- yes, Susan gave US hats this year! We happily walked the entire way. We took the whole family, and the kids chased after each other on scooters. At the end, we waited so we could take a big picture. We all crossed the finish line fashionably late, and we crossed it together. I'm so glad that Susan is a survivor and that you and she went as part of a team. I hope you can keep doing this for many years. Thank you for sharing this with us! I am sure that I am somehow "better off" for having read it. So much of our human existence is a struggle against our own fallen human nature, it seems. Reading this helps me to remember that we are also capable of greats feats of valor. Keep running Laurie; it is dong you and the others affected by it (including us now) more “good” than you probably realize. Which is not to say that I do not think you understand how good this is, it is to say that we only get so many chances at experiencing these types of “good;” we need to fully grab onto every one of them. She clearly was not wearing it, as you can see by the picture, but that omission is understandable. Good job, Laurie! My partner and I have have several friends who have fought the B/C battle. Most have won and a couple of them, sadly, have not. In support, we have done the Koman walk 3 times now in 2 different cities. It's a wonderful experience. Every year we look forward to being able to do a small but important part in the fight. I whole heartedly encourage anyone who hasn't had the experience of participating in a Koman event to do it! Here in Buffalo NY, we have a huge cancer clinic, (Roswell Park) that has several fund raisers during the year. As there is a cadre of runners and bikers in the Bflo Phil,they usually participate in the running and riding. As a prostate and multiple myeloma stem cell recipient survivor, I volunteer each Tuesday and during most of the fund raisers. My value is when a patient I'm wheelchairing to radiation or chemo says, "You have no idea what it's like", I offer to display my 3rd set of hair...this usually results in some uplifting dialog. For those that haven't been touched personally or had a close friend afflicted, odds are that it's just a time differential. We're all stuck here on earth and must make do...pity our plight is compounded with war and greed, when there's chamber music to be enjoyed ! thanks for your courage. Maybe we all can look life in the face a bit differently. congratulations! running for such a goal is always the best prize. Wish I had been there too.